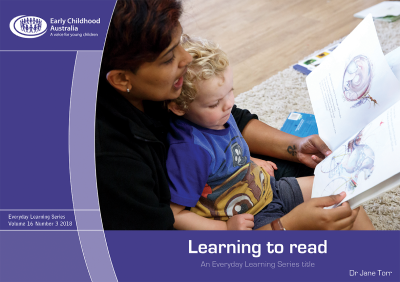 Talking and learning has been written for carers of children from birth to six years, in particular, educators in early childhood education and care services and families. The main message of the book is that talking with young children, listening and responding to them, and helping them learn to talk and to use talk to learn are critically important in children’s lives, both in the present and the future. There is much research to support the importance of children being able to talk fluently, express themselves clearly, reflect upon their experiences, develop ideas and communicate with others. Being able to talk well and to use talk in order to learn are key elements in literacy learning and underpin the entire education system. the role of play in learning to talk and talking to learn. The focus is not upon direct teaching, but on recognising the potential of everyday activities in homes, communities and early education and care services to assist children in learning to talk and having the ability to use talking to learn. Also available in hardcopy here.